There’s something intoxicating about boating on a river as beautiful and complicated as the Snake. 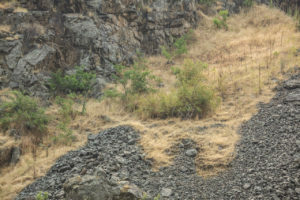 That wonderful waterway, like an undisciplined maverick, cuts its way through Hells Canyon, joins the Columbia River, and ultimately empties into the Pacific Ocean 300 miles to the west. The jet boat my alter ego Arnie and I took that hot August day navigates up and down the lively river with unrivaled authority. Ours may be the largest boat skimming across the water, but it isn’t the only one. 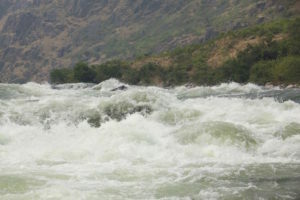 Dozens of inflatable boats and kayaks dance over the glassy water and down the several rapids like sassy water skippers. “There’s no way under God’s sky those inflatables can return upstream though those rapids,” I marveled snapping photos of a cluster of colorful boats being readied for launch. We were boating in a section in the river where the banks were relatively flat. “Look at that,” Arnie shouted pointing. All heads turned to our left. 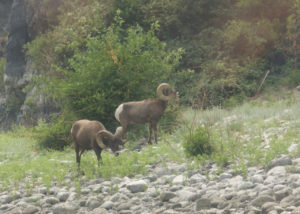 There on the banks were two bighorn mountain sheep calmly grazing near the water. “Ohs and Ahs” filled the air. Cameras clicked. The sheep obviously had no fear of humans. 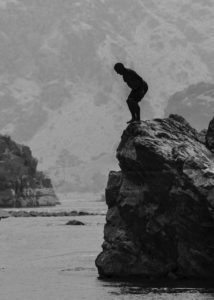 “Got a feeling those fellows can mountain climb those granite walls, if anything can,” I said admiring the handsome animals. “Yeah, ride ‘em cowboy,” I agreed, imagining the more than a mile-long trip down to the riverbed. “Wouldn’t want to have been standing below either!” Arnie laughed. 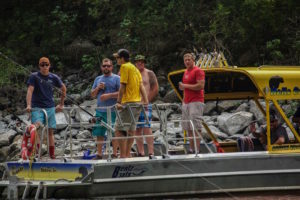 “Look at all these people fishing,” Arnie said gesturing at a boat loaded with gear and fishermen. “There would have been lots of fish, wouldn’t there?” he quizzed. “What are all these fishermen doing with their fishing poles,” I asked giving voice to Arnie’s question. “Good question,” the well-dressed man said. Measuring a 150 sturgeon fishermen caught (and released) in the Snake River. Just then, the pilot brought our craft to a floating stop. He’d caught sight of a pretty woman sitting on a deck stool straining her fishing pole trying to hold onto something she had snagged. Of course, we all wanted to see. 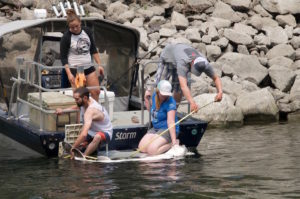 The pilot treaded water until she, with a little help from her boyfriend, managed to pull in an 83-inch sturgeon. “A fine looking fish,” another man in our boat called across the water. “Probably weighs in at 150 pounds,” the boyfriend proudly said. Then to our surprise, they unhooked the sturgeon and let it melt away back into the deeper water. “Why’d she do that? I asked. I laughed at Arnie’s absurdity but he had a point. Laws didn’t limit those starving explorers. Still, how is it that they were without food, when there were fish in the river? Seemed absurd! We moved away from the catch and release scene and came to a sizable chunk of basalt sitting in the middle of a calm water inlet. The pilot anchored nearby and we plunged into the cool water for a swim. Refreshed, it was time to goose up the jet engines and make our way back up river. I was relieved that going upstream through the rapids was less tumultuous than going down . . . I wouldn’t have to worry about keeping my camera dry. 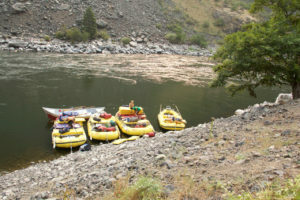 However, demonstrating a sense of humor, our mischievous pilot charged up one of the category 4 rapids, circled back down and then back up in an attempt to make sure his load of adventurers got their share of water dousing. It was all in good fun and I did manage to keep my camera dry. My camera . . . that remarkable piece of technology that helps me bottle rare contents of exceptional days . 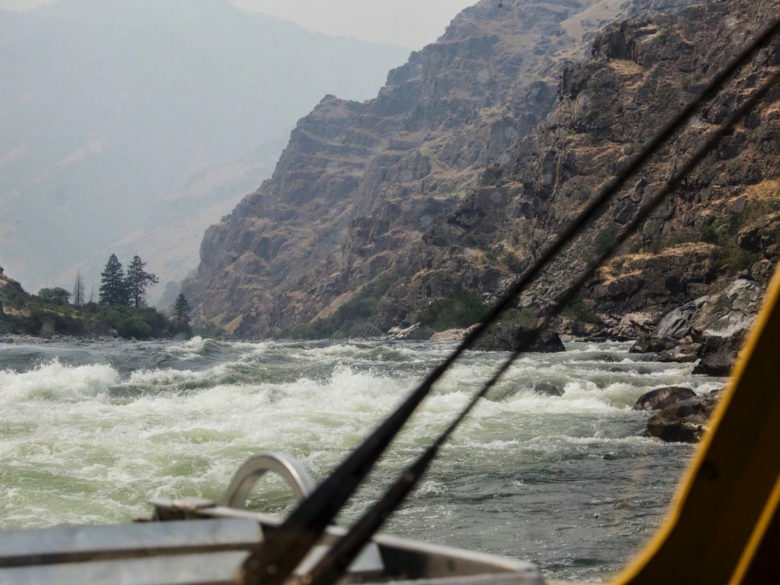 . . this time on the Snake River in Hells Canyon.